Nestled in the heart of the city, close to Rasuna Epicentrum, the 53-hectare retail, lifestyle and entertainment complex, this stylish new four-star hotel features 323 comfortable rooms and suites and a full collection of upscale amenities, including four floors of flexible, state-of-the-art function space. The hotel soft-opened on Friday, 29th March 2019, with an intimate ceremony attended by company executives, partners and selected media. “Jakarta is one of the most exciting and dynamic cities on the planet. As the capital of the world’s fourth most populous country and the centre of the ASEAN region, this is a regional hub of trade and tourism that will continue to grow in popularity among visitors from across the globe. We are delighted to unveil Swiss-Belresidences Rasuna Epicentrum as our 7th hotel in Jakarta, creating even more opportunities for corporate travellers, leisure guests and event planners in the heart of the city,” said Gavin M. Faull, Chairman and President of Swiss-Belhotel International. Swiss-Belresidences Rasuna Epicentrum offers a choice of Deluxe Rooms, Grand Deluxe Rooms and Suites, which start from 30 square metres and come fully equipped with sleep-inducing beds, power showers, working desks, LED TVs with international channels, mini-bars, coffee and tea making facilities, laptop-sized safes and complimentary Wi-Fi. Each of the 54 spacious suites also features a separate living room with a comfy sofa, coffee table and a second TV. Guests can dine at a choice of contemporary F&B outlets, including the Swiss-Café™ Restaurant, a vibrant all-day restaurant with indoor and alfresco seating, and the classic-style Lobby Lounge & Bar, which provides the perfect place to catch up with friends and colleagues over a daytime drink or sundown cocktail. In-room dining is available 24 hours a day. The hotel is also an exceptional venue for conferences and events, with 18 intuitively-designed function spaces spread over four floors, all supported by the latest audio-visual technology. This allows Swiss-Belresidences Rasuna Epicentrum to host a full range of corporate and social events, from high-level conferences and business meetings to glittering evening parties and unforgettable weddings in the pool side area. When guests are not working, they can enjoy a range of leisure facilities including a tropical outdoor swimming pool, spa services and a fitness centre. Alternatively, the nearby Rasuna Epicentrum and Epiwalk Mall are great destinations to unwind and indulge in a spot of retail therapy. Since arriving in Indonesia more than 25 years ago, Swiss-Belhotel International has built an extensive collection of more than 60 hotels and resorts all across the country. It is now one of the country’s most well-known and well-loved international hotel brands. This is highlighted by the fact the group has been named as “Indonesia’s Leading Global Hotel Chain” at the Indonesia Travel and Tourism Awards (ITTA) for eight times. 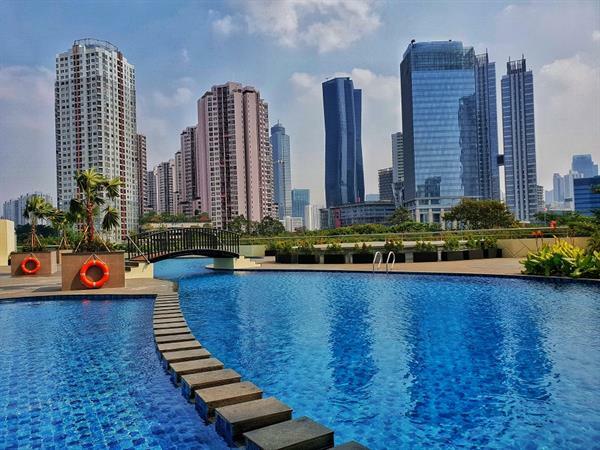 The launch of Swiss-Belresidences Rasuna Epicentrum forms part of a major expansion strategy in Indonesia, which will increase Swiss-Belhotel International’s nationwide portfolio with at least 30 projects in the pipeline.